The City was originally conceived for and shown on rotation at the 1939 World's Fair, in New York. Hundreds of thousands would eventually see this short documentary and its vision for a new communal way of living. Set in three "movements", we follow the American way of life from its pastoral origins, with reliance on the farm, church, and town hall; to the oppressive, congested and dysfunctional urban existence of the industrial age. We then fly (via modern airplane) out into the countryside to witness the new vision of the American city: a well planned, communal and modern utopia where a natural integration of work and home life makes for healthy and productive citizens. 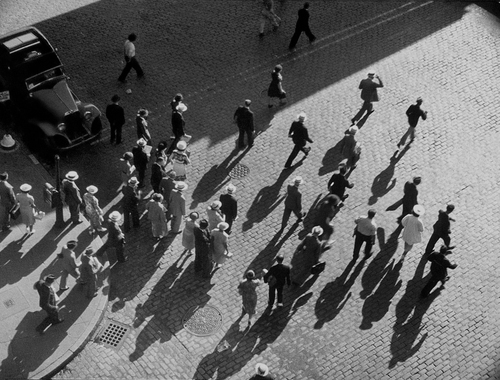 The City is a propaganda film for the ideals and vision of urban planners of the time; but with Copland's music, its spare and unconventional use of narration, and kinetic editing, the film borders on the experimental. The film was originally conceived by renowned planner and author Catherine Bauer Wurster, and produced by the American Institute of Planners. It was shot and directed by Ralph Steiner and Willard Van Dyke, and written by planner Lewis Mumford. Aaron Copland composed the score, which would lead him to greater success in motion pictures. Come enjoy with us, and learn more about how we have understood the city in the past and how that can inform us into the future. Free with $5 suggested donation.